When we think of Ukrainian immigrants to the US before World War I, we typically imagine them in the coal mines of Pennsylvania and the big industrial cities of the East and Midwest, because that is where the vast majority of them ended up. Mostly, they came from what is now western Ukraine (Galicia) to earn money so that they could go back home and buy land. Those immigrants who wanted to become farmers in the "New World" tended to go to Canada and Brazil, which had much more generous homesteading prospects. However, some Ukrainians did indeed settle on the US Great Plains. This photograph from the Fr. Gregory Chomicky papers in the Center's Archives gives us a hint of what their lives might have been like, and raises some very interesting questions. The photograph is not dated, but was found among materials from the second half of the 1910s and is labeled on the reverse: "Україньска [sic] народна церков св. Архіст... Міхаїла. Жюліян, Монт." ("The Ukrainian National Church of the Holy Archangel Michael. Julian, Mont."). Montana? That is definitely not a place one associates with Ukrainian immigrants. There were some Ukrainian communities on the Plains during this time, settled by migrants who had been planning to go Canada, or who had crossed over the border into the US. The most notable was the town of Ukraina, North Dakota, where migrants built traditional thatched-roof houses, organized a church, and had a thriving community in the 1910s and 1920s. Where was Julian, Montana? If you try to find it on Google Maps, you will come up empty. It turns out that Julian was a tiny town in what is now Daniels County that was active in the 1910s to the '30s. An article in the Ukrainian Weekly (June 20, 1936) mentions a community in Scobey, MT founded by Ukrainians moving from Canada in 1897. 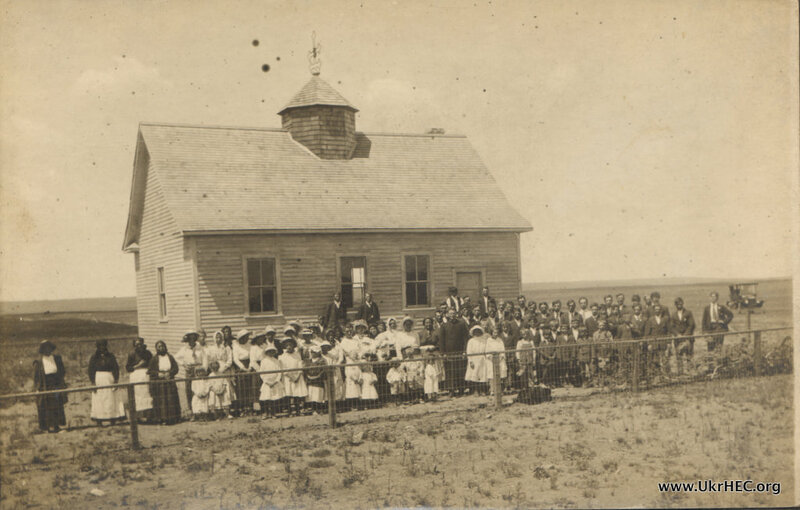 Scobey is the current county seat of Daniels County, so it is likely that this photo is of people from that community. So, what was this "Ukrainian National Church"? In 1915, a group of parishioners of St. Nicholas Ukrainian Catholic Church in Chicago split from the parish and founded a break-away "Ukrainian National Church" under the Old Catholic bishop Carmel Henry Carfora. Some of these parishes (including the break-away Holy Trinity parish in Chicago) formed the basis of the first distinctly Ukrainian Orthodox Church in the US. The Vicar General (and rector of the Holy Trinity parish) was none other than Fr. Gregory Chomicky, in whose archives this photograph is found. Under his leadership, the Ukrainian National Church had grown to six parishes by 1916 (according to Myron Kuropas' classic history of Ukrainian Americans), and this church in Montana was likely one of them. But the most intriguing and mysterious detail in this photo are the women on the far left. Based on their dress and where they are standing, they don't look like they're "part of the group". In fact, their features look surprisingly Native American. Could there have been interactions between Ukrainian immigrants and American Indians? This is not impossible, as the southern end of Daniels County makes up part of the Fort Peck Reservation, home to members of the Assiniboine and Souix nations. If these women were indeed Native American, what were they doing there? Were they converts? Were they "hired help"? We actually have no idea, and it would make a wonderful thesis project for an aspiring historian! The Center would like to thank Peggy Delaney of the Montana Bureau of Mines and Geology for helping to chase down the location of Julian, Montana. I agree with your article and think I can add a bit to it. Ukrainians seem to have preferred Western Canada to the US. My grandfather, along with his family, came to Canada in 1900. They ended up in southern Manitoba. My mother was born in Stuartburn, Manitoba in 1902. In looking for good land to farm, my grandfather went to North Dakota. He didn't find what he wanted so he came back to Canada and found what he thought was suitable land in the area of Borden, Saskatchewan and settled there. (About 60 km north of Saskatoon) I have tried unsuccessfully, to find where Ukraina, N. D. is located but now believe it is far across the state from where I thought my grandfather would have gone to look for land. My father came to Canada in 1912, as a 17 year old young man, on his own. He worked for 2 years in the lumber camps in the mountains of British Columbia (Fernie). Desiring a different life, he went to Alberta (Vegreville), learned English, went to Edmonton and completed a High school diploma so he could attend University (Normal School) and become a teacher. All of this tells me that Ukrainians could be quite mobile if they chose. Being hard workers of peasant stock, they believed strongly in God and the Ukrainian community and worked diligently to achieve more. As you suggest, if Julian was established by those Ukrainians who travelled through Canada, and the US was the melting pot that it is today, I would not be surprised if Ukrainians melted in and were "lost." Canada has always been more of a mosaic. As for the ladies in the far left of the picture, they may have been natives (First Nations). There are Metis in Canada who have Ukrainian sounding names. Most were French/native but no doubt early Ukrainian settlers bonded with the indigenous Canadians. On the other hand, perhaps these ladies, not being dressed in the white refinery of the others, just stepped aside. Their clothing is not unlike what Ukrainians would also wear. I have enjoyed the research I have done to write this.